What if I told you that you could combine the skin rejuvenation properties of Microdermabrasion with Botox? Or even that you weren't limited to Botox, but that a number of different treatments could be combined with Microdermabrasion for a special skin rejuvenation effect known as micro-channeling? If that sounds pretty good, you might be interested in the new product, AquaGold. Not only is AquaGold one of the finest Microdermabrasion instruments by itself, but its combination with the serums means it has flexibility. 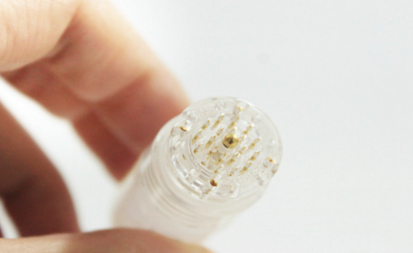 The gold needles used in AquaGold (yes, they're actually made of gold) are thinner than your hair--and they're actually made from 24-karat gold. Those are some fine needles. Microneedling of course works on the principle of Microdermabrasion. Very precise puncturing stimulates collagen and elastin production. The more controlled the effect, the better the results--after all, the point isn't to 'damage' the skin, but to facilitate healing. If we could get the healing effect without damaging the skin, that would be ideal. AquaGold uses the puncturing effect, however, to deliver a propriety serum into your body--taking advantage of the fact that it's more receptive to absorption. This proprietary serum is filled with ingredients ranging from Botox to hyaluronic acid to growth factors to help it heal. These different ingredients can heal your body, tighten pores, help hydrate your body and more. What happens, then, is taking an already great skin rejuvenation technique and making it better. Overall, the effect is what's known as "micro-channeling," because the punctures made to stimulate collagen in essence become absorption channels into your body. If Microdermabrasion is hacking your body's healing process, then micro-channeling is like Wolverine's X-Factor. If you want to know more, call Hagerstown Dermatology & Skincare to schedule a complimentary consultation today.